Adding a new file type to an existing code highlighting style is very straightforward in Notepad++. I wanted the velocity template extension “.vm” to be associated with the html style markup rather than applying it manually each time (I know, still using Apache Velocity in 2016). This is very easy and straightforward. 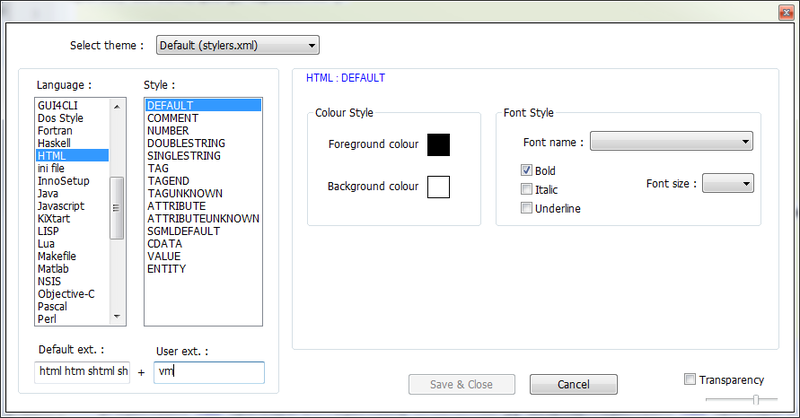 Under “Settings > Style Configurator” from the toolbar HTML can be selected from the language selection box then “vm” just needs to be added to the “User ext:” Text box. Now any .vm file will open with the HTML code highlighting automatically. This entry was posted in java, Note To Self, Programming, Uncategorised, Web Design. Bookmark the permalink.